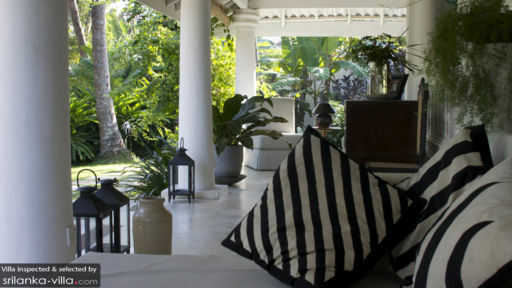 The embodiment of a true Sri Lankan home, The Well House is the product of a designer’s imagination with pristine gardens teeming with tropical flora, old-world interiors with a vintage flair, and plush seating found in every nook and cranny of the house. 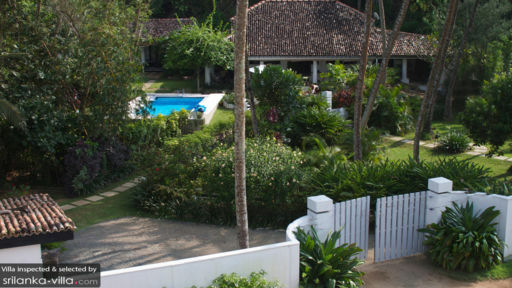 A three-bedroom vacation rental just a five-minute drive from Galle Fort and a three-minutes’ walk from the beach, the bungalow piques your holiday mood like no other. You will find that the bungalow is a celebration of the past and present, nature and modern living infused as one functioning body. You will find three cosy and air-conditioned bedrooms at the bungalow, each furnished with a canopied, four-poster double bed, amply cushioned armchairs, writing desks, and coffee tables. The bedrooms are intimate and inviting so you will have no trouble settling in as if it were your own room back at your home. There is a television in one of the bedrooms for your enjoyment although, you’d end up spending all your time gazing outdoors. The bedrooms come with en-suite bathrooms that are equipped with modern amenities and necessary facilities for your convenience. 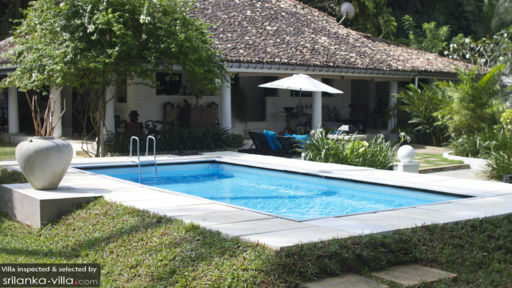 If you’re travelling with friends and family, then The Well House with its private swimming pool and expansive gardens will serve all your needs. You can easily and restfully lounge beside the pool on the sun chairs or inside the pool while relishing in its refreshing water. The gardens are basically your playground to do with as you please but respectfully. While the kids are running around, you can get some exercise in or everyone can play badminton, catch, or other simple yet fun games. The terrace is furnished with comfortable and cosy chairs, chaise, loungers, and sofas – a great space to unwind with drinks in the evening. The living area at The Well House will instantly remind you of a centuries old cottage which has been designed with affection to provide immediate comfort and warmth. The homely ambiance is owing to the plush, white couches that you can easily sink into, flower arrangements for a whiff of nature indoors, muted lighting, and rustic furniture. You can relax indoors or out on the terrace where there are numerous low-floor cushioned sofas that overlook the gardens for a peaceful and calming atmosphere. When you’re hungry and wish to enjoy a meal with everyone together, then the alfresco dining area at the bungalow found on the terrace is the most idyllic spot. With a lavish view of the garden, your meal will taste even better coupled with the fragrance from the flowers and the fresh tropical breeze. The fully-equipped kitchen is at your disposal so you can cook some snacks and make tea/coffee whenever you please. The bungalow is fully-staffed with efficient staff members to look after you and the property as well. Since they know a lot about the neighbourhood, you could always ask for recommendations and request for services such as chauffeur-driven cars, in-house massages, or a personal chef that are available at an additional cost. Since the house is located so close to Galle Fort, the first order of things is to take a trip to witness the age-old structure in all its glory. It dates back 400 years and stands as majestically as it did then. When you’re not headed to the beach, head into town to visit some of the shops, eateries, and boutiques for shopping.